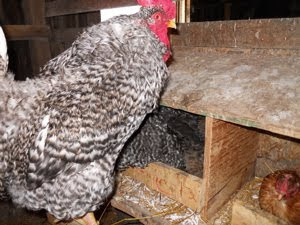 Life at Busy Solitude Farm: Hens Get to Work! 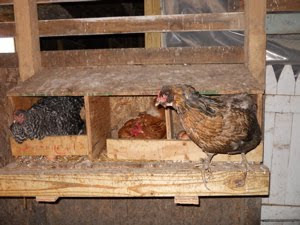 Every day I remind the hens "people need eggs to eat! Please get to work!" 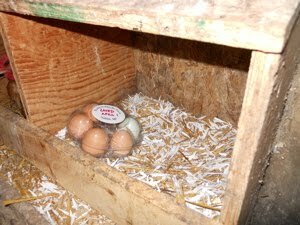 And I get home and find a few dirty eggs in the nest that I have to take inside, scrub, and put into our Busy Solitude Farm cartons for your enjoyment. 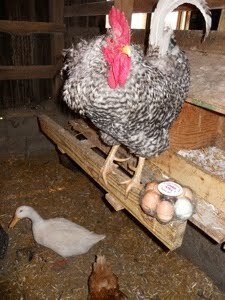 See the extra tail behind this hen? Two on a box!!! 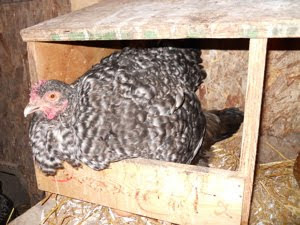 And much to my surprise, when this Ameraucana hen left her nest, what did I find? 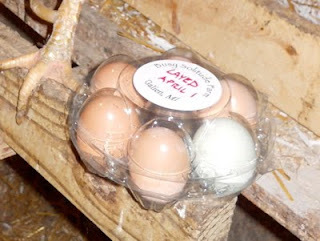 A neatly packaged half-dozen eggs, all clean and shiny!!! Egglebert gave them his stamp of approval, and you should, too! 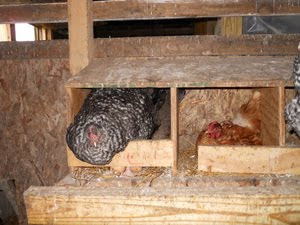 He must have motivated those hens to get busy! I love eggs from my head to my legs! Egglebert is doing a good job fertilizing and supervising. Wow! And without thumbs, too! Impressive. Where'd you get the cool egg carton?